Half Marathon in 2 weeks! Ive been going into Saturday's long runs with a mixture of excitement and dread. The past 3 long runs i've completed felt ok, but the rest of the day I ended up feeling like sh*t. Since I only run 4 days a week, feeling like crap 25% of the time is not acceptable in my book. 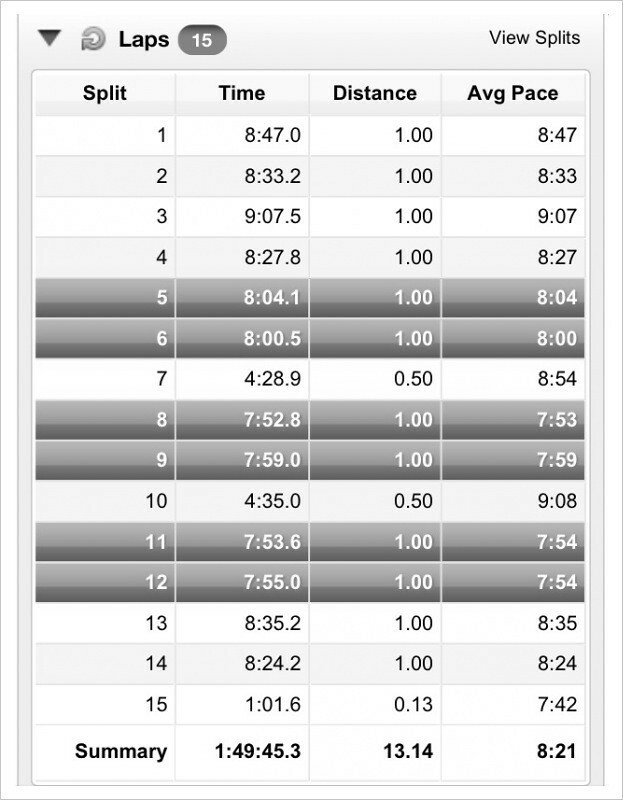 I re-evaluated what I do before and during run, and also decided this week to tweak my post run routine. Cut to the point, So far I do not feel crappy like the past 3 Saturdays. Friday- ate lentils, rice, some brussel sprouts & 2 medium boiled eggs for dinner. Also drank a deliciously hoppy IPA. Saturday Pre Run- upon advice from Coach, I tried to limit my sugar intake and just had a banana instead of the honey stinger waffle. (Would have had a bagel or toast, but didnt have any!) Drank a quarter cup of coffee. 20 minutes before the run, I took the gatorade prime & a salt pill. The first half of the run I just felt blah. Im not going to analyze this because not all runs are of the OMG FREAKING FANTASTIC RAINBOW POOPING PONY variety. Didn't have the spring in my step i've had on the past 2 long runs. Yet, mentally I was all game for this run. 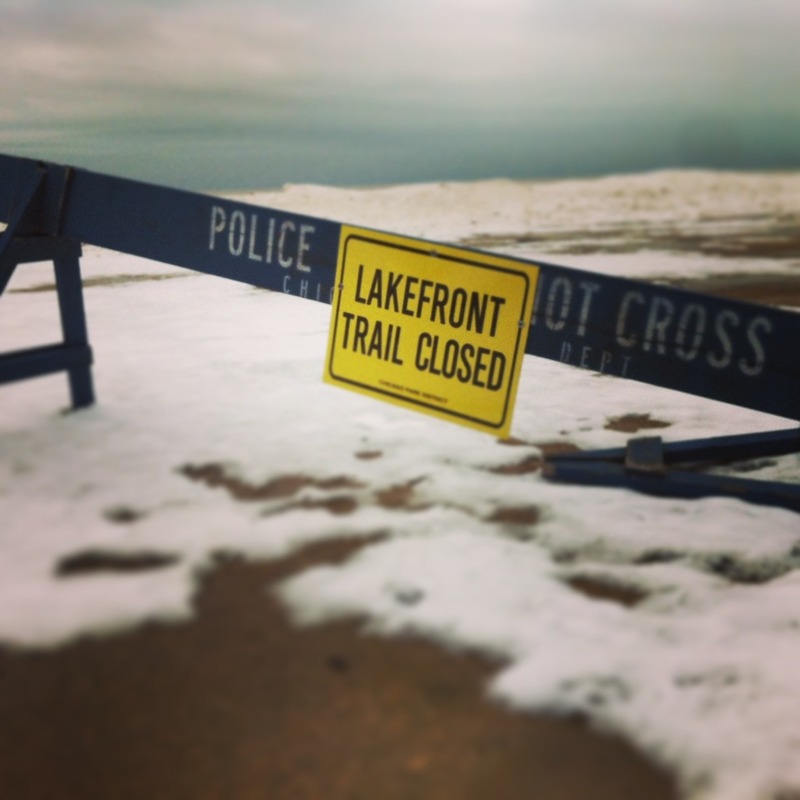 When I got up to Oak St beach I wondered what the condition of the path would be. Soon I realized it was covered in 5"+ of ice. I ran a small way, and had to walk. I was slipping all over the place. With the start of mile 5 brought the first of the 2 miles at steady pace. This first 2 miles killed me. I even thought about turning around and trying again tomorrow. But I kept at it. After mile 6, I choked down an almost frozen GU and another salt pill. I also carried water with me and made sure to drink a little more than I felt I needed to. Maybe it was the GU and/ or salt, but after that my run seemed to turn around for the better. I felt light and springy and the other 2 sets of 2 miles felt fantastic. For runs of under 16 miles, I usually dont take anything- maybe just a salt when it's hot unless it's a race- then I'll take some GU. 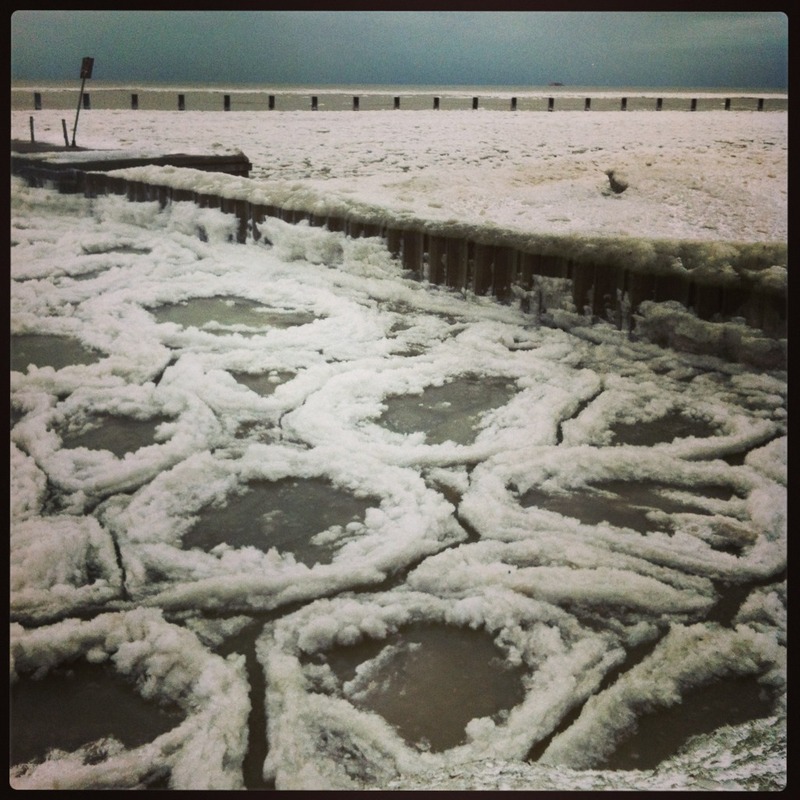 I was mezmerized by the Pancake Ice swaying in the waves. I could have stood there for a while watching it. The highlighted miles are the "Steady" pace miles. At times during this run I felt very cold and then very hot. Perhaps it was the wind. The first 6 miles I ran into some wind- most notably at mile 3. I also saw people setting up for the Polar Plunge near Castaways. 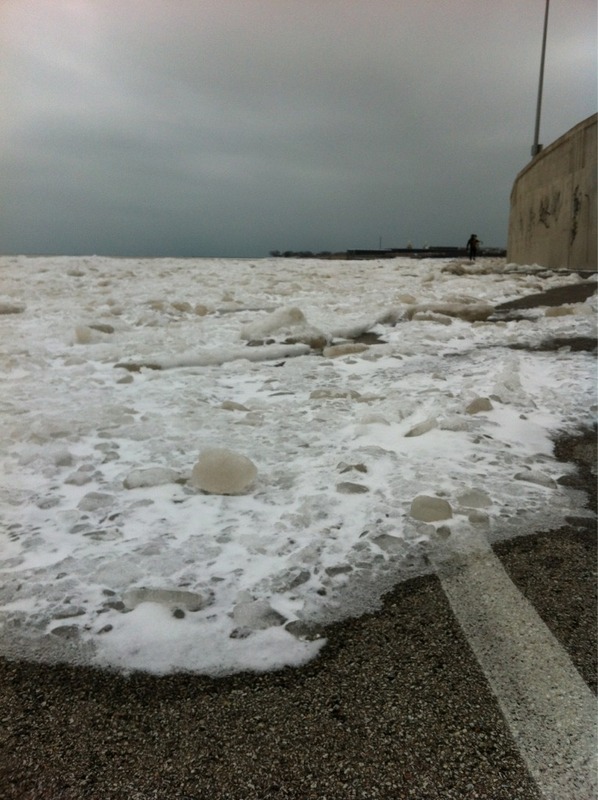 I cannot fathom why people would want to jump in Lake Michigan when the harbors are covered in ice! YIKES! *I also saw people ice fishing in one of the harbors too. Today I wore my Brooks Pure Cadence 2's outside for the first time. (I've worn them 2 times on the running machine since I got them a few weeks ago.) They were light and felt pretty good- I like how the arch is higher in these compared to my other shoes. I'll probably wear them for the half marathon. Drank a small protein shake when I got home. Also drank a large Earl gray latte from Caribou, then soaked in a hot bath for entirely too long. Then I got RAMEN for the 3rd week in a row. It really hits the spot post long run. I feel there are too many variables to adequately pinpoint why I felt like crap post run for the past 3 weeks and why I'm feeling good today. With no injuries to speak of thanks to my dedication to the Trigger Point Kit, The Stick & Foam Roller, I am still contemplating what my next steps will be for races this year. But for now, I'm incredibly thankful that I'm healthy and feeling good post long run. Nice job on the run! That is super fast by itself, and especially counting in the weather and footing. And those ice pancakes look crazy! That would be tempting to watch them for a while. 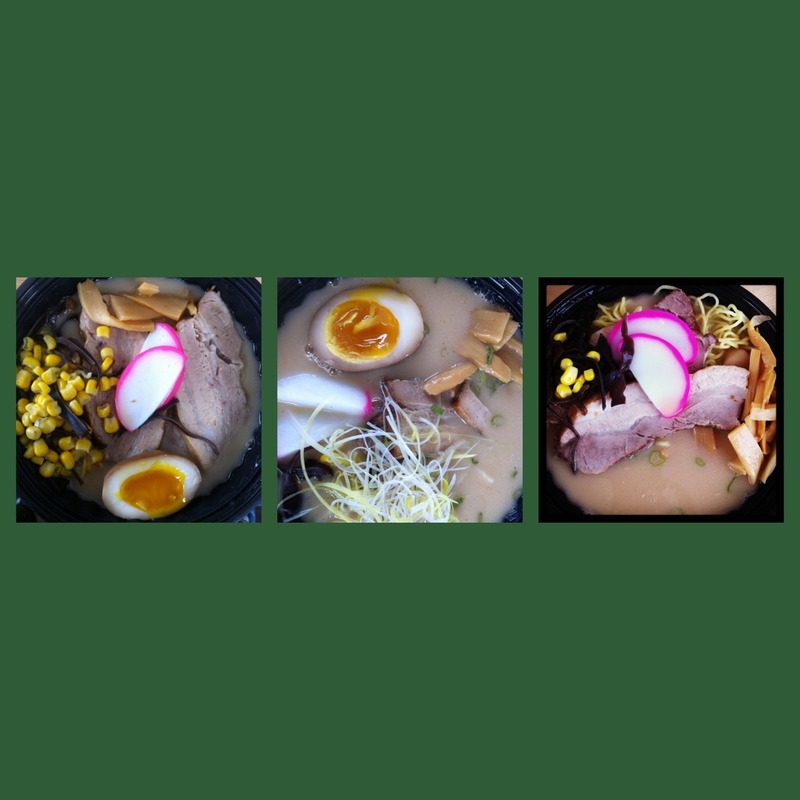 And that ramen looks great. Thanks! The Ramen is sooooo delicious! Its filling the void of the pho that im missing in my life since moving away from the SF bay area. Nice video of the ice pancakes. They are very cool/odd, but one of those fantastic things you could only see if you are running or walking. Oh, how I want to get back down to the Trail! Maybe tomorrow, maybe next week. Good job on the 13 miles today and that you felt good post-run. You probably are settling into the long runs nicely. I am starting to get pumped for the Get Lucky Half. If I am able, maybe we could pace each other for the first part of the race. 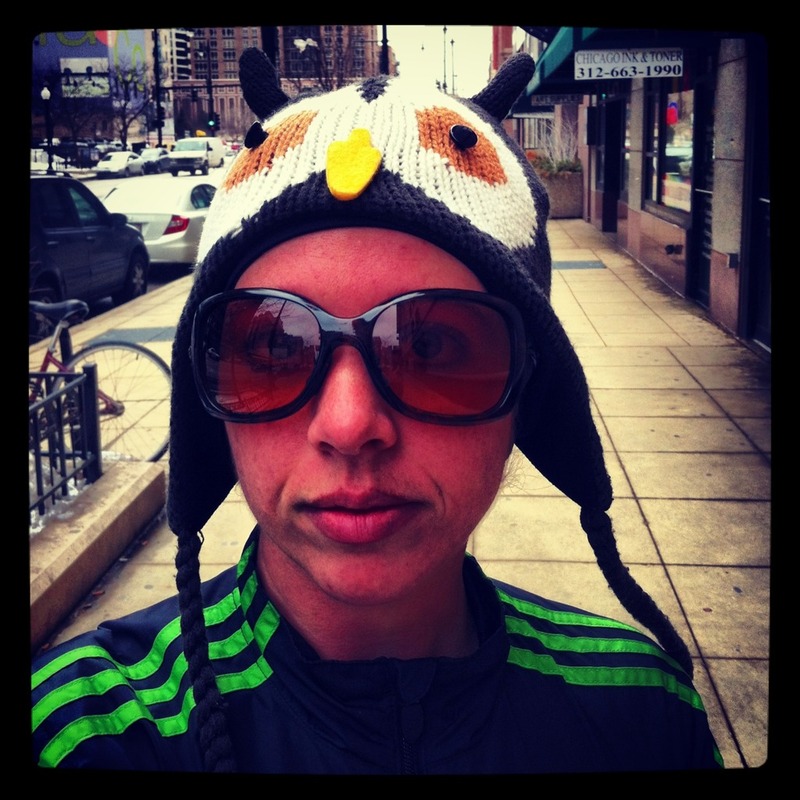 I want the race to be cold so you can wear your cool owl hat, and also because I really like to run in this weather! I will know more about my abilities and injury by next weekend. Those polar plunge people are crazy. I wonder if I could ever do that? Keep me posted about get lucky- I hope your ankle cooperates! AND, I hope its cold so the owl hat can make an appearance. Pancake ice is neat, I had never seen that before. 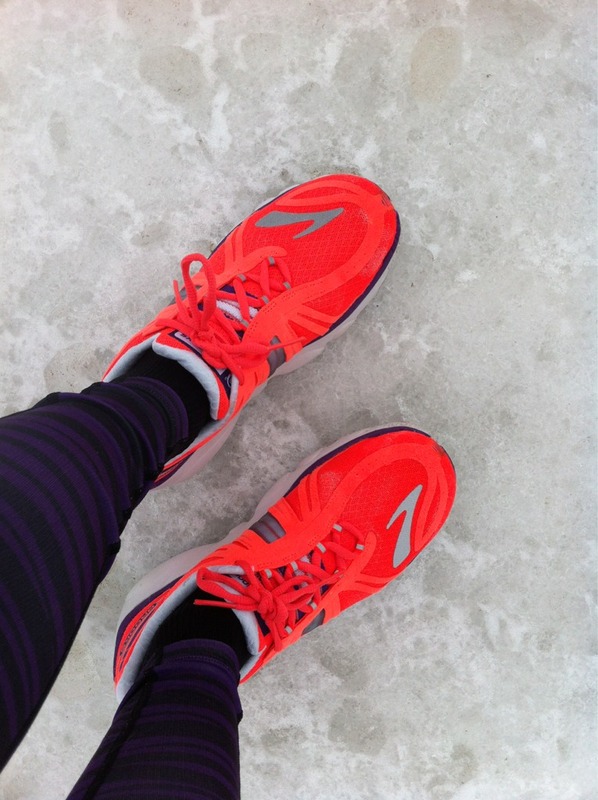 Looks like your long run went really great despite the cold weather. My long runs are starting to feel pretty good. I have a half in two weeks also and am so excited. I am dressing all green for st paddys day. I am just waiting until closer to race day to see what the weather will be like to finalize what i will wear. keeping my fingers crossed for nice weather! Hope you get to wear your owl hat, I love it! Yes, way too many variables to figure out exactly what the deal is sometimes. And you can make yourself crazy trying to figure it out! Great work my friend! That's usually how those kind of repeats go, you need some time to get in your rhythm and then your body just adjust accordingly. Miss those little icebergs, that's always been my favorite part about running on the lake in the winter. Last year we didn't really get those, so I missed them in my last winter season :( Coming downtown tomorrow, hope I can get a peek of them then! Keep up the great work! You're on track for a pretty stellar half performance. Those weird rectangular ice things are crazy, I wonder what causes that! And how do you feel today?! I hope you are continuing to feel awesome. It sounds like the salt and extra water really helped. we are shoe twins, almost...I have the purple ones! Great work hon! Those ice pancakes look awesome! I would have stopped and stared at them for awhile, too. The variables can drive you crazy! You're doing so well...keep it up and stay injury free! Love your owl hat! LOL I hate the variables, too. I make myself crazy trying to figure out why I feel good or bad and if it's something I did or a virus or what. Blah!